Many views of the body are based on real or imaginary “slices” called sections or planes. In studying the body or organs, you often will be observing the flat surface of a section that has been produced by a cut through the body or a body part. Such sections are made along specific planes. 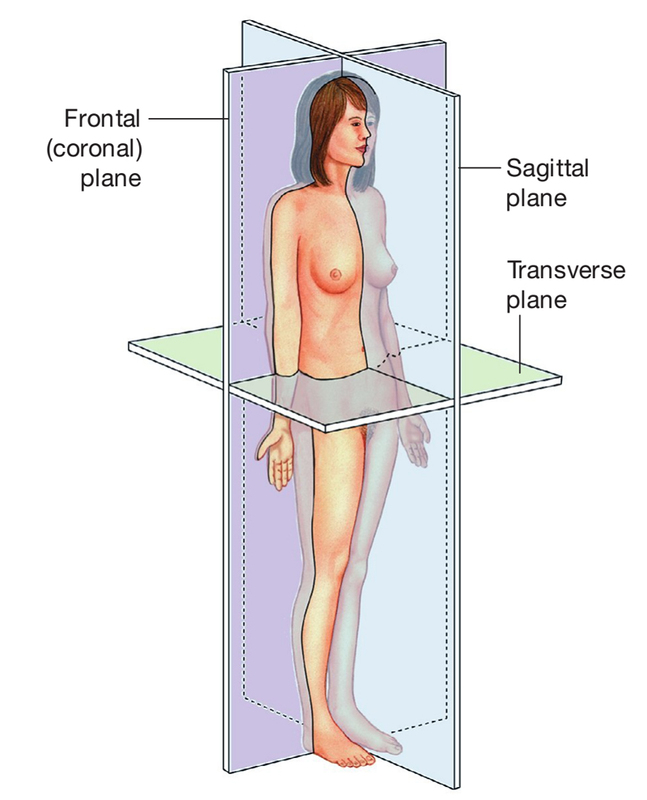 These well-defined planes: transverse, sagittal, and frontal planes, lie at right angles to each other. It is important to understand the nature of the plane along which a section was made in order to understand the three-dimensional structure of an object being observed. The terms that follow describe the different planes and sections you will encounter in your anatomical studies; they are also used in many medical procedures. Planes are imaginary flat surfaces that pass through the body. Let’s discuss them here below. Transverse or horizontal planes divide the body into superior and inferior portions and are perpendicular to the longitudinal axis of the body. It divides the body or organ into superior (upper) and inferior (lower) portions. CT scans are typically transverse sections. Sagittal planes divide the body into right and left portions and are parallel to the longitudinal axis of the body. A median (midsagittal) plane passes through the midline of the body and divides the body into equal left and right halves. A parasagittal plane does not pass through the midline of the body. The head and pelvic organs are commonly illustrated on the median plane. Frontal (coronal) planes divide the body into anterior and posterior portions. These planes are perpendicular to sagittal planes and parallel to the longitudinal axis of the body. A frontal section of the head for example, would divide it into one portion bearing the face and another bearing the back of the head. Contents of the thoracic and abdominal cavities are most commonly shown in the frontal section. Cuts made through sagittal and frontal planes, which are parallel to the longitudinal axis of the body, produce longitudinal sections. However, the term longitudinal section also refers to a section made through the longitudinal axis of an individual organ, tissue, or other structure. Similarly, cuts made through the transverse plane produce cross sections of the body and can also be produced in organs and tissues when cutting at a 90 ° angle to the longitudinal axis. Oblique sections are created when cuts are made in between the longitudinal and cross-sectional axes.